I haven’t had a chance to do a Friday favorites post in awhile. I really loved spending a few minutes thinking about all the happy things in my every day life when I shared favorite moments…and I want to get back to those. Like the fact that Zoe has started potty training!!! I am so not ready for this, but apparently she is. When we came back to school from Christmas break, they had a note on her sheet to bring in pull ups, that they had already started potty training with her. I was like ummmm what?!?!?! I have to be honest, I haven’t been the best with it at home on the weekends. But we had a rough morning last Sunday. I had taken her to the store by myself and she had a huge meltdown over something ridiculous in the store. And I was that mom with the screaming kid that everyone was looking at. When we got home, I was just worn down and ready for her nap time, but I had to get her lunch ready first. All of a sudden, she comes running up to me and says, “Mommy I have to potty!! !” And she takes off to the bathroom. Now, I had put her in there a few times before and nothing happened. I was a little irritated because I thought this was just delaying lunch and nap time even more. But she told me to “go away” as she always does, so I was out in the hallway and she comes out and says “All done!! !” I go in there, and she had gone!!!!! She went again this past weekend too, and has been coming home with 2-3 times circled on her sheet at daycare this week. I suppose it is time for potty boot camp weekend? I dont know. Why do they grow up so fast??? I am so ready to not have to buy diapers all the time, but also, so sad that my little baby is so not a baby anymore. When I was at Target picking up a few weekend essentials, I came across some macarons in their bakery department, and this gnocchi in the frozen aisle!!! These are two things that we have to travel 45 minutes to Trader Joe’s for that I can now get on a regular basis locally. So excited! I spent about an hour pinning air fryer recipes this weekend, since we finally pulled the trigger on this one!!!! If you have any great recipes, send them my way! I have been trying to do more fun, healthy snacks at home. I do fine for lunch and dinner, but weekends are out of control…and so is snacking. And it is so hard to find an easy breakfast that isn’t a million WW points. I hate eggs, and that is really the only zero point easy thing. I found some smoothie bowls that I want to try. And how amazing do these look? I met up with a friend last Friday for lunch at Pizitz. I wanted a poke bowl, but she was excited about Busy Corner Cheese & Provisions, and I decided I didn’t want food envy and followed her. 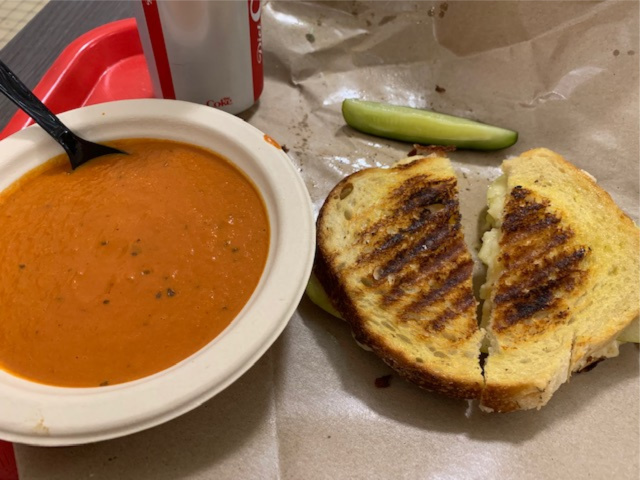 I had the Vermonter which was Cabot clothbound cheese with granny smith apples on toasted sourdough and a cup of tomato soup. SOOOOO GOOOD!!!! Plus, it is always good for the soul to lunch with a great friend! It had been a month since our last lunch, and we really have to get better about being more regular! Yay to Potty training!! Your tomato soup and sandwich looks so good and this apple treats…well, I wanted to pluck one off the screen and out it in my mouth!! Hooray for potty training!! 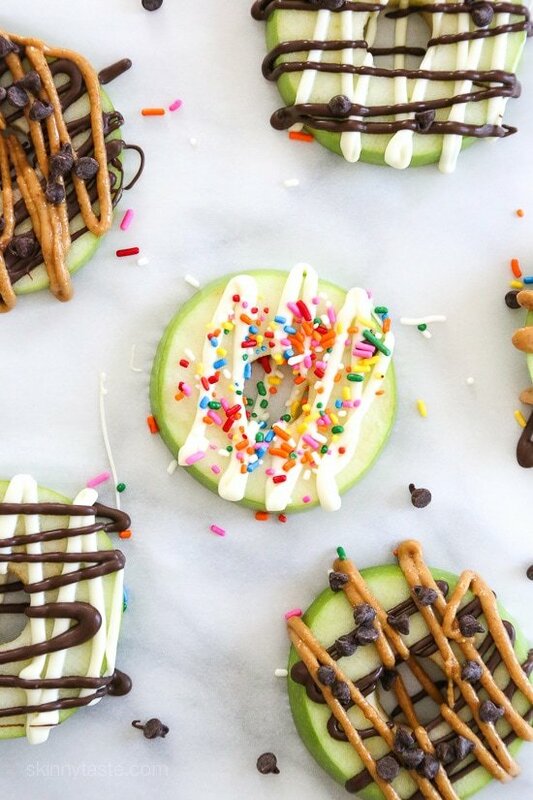 And those apple snacks look so good – I’ll probably have to steal that idea. Let me know if you find any super awesome recipes for the air fryer – I’m still trying to convince B that we have to have it. I just saw another blog post that said that they made pancakes in their Ninja air fryer!!! DID YOU KNOW THAT WAS POSSIBLE????? I gotta find out how! Yay for potty training! My boyfriend is eyeballing this air fryer/instant pot that he thinks we must have. I am not sure we need it but I won’t be mad if we get it! 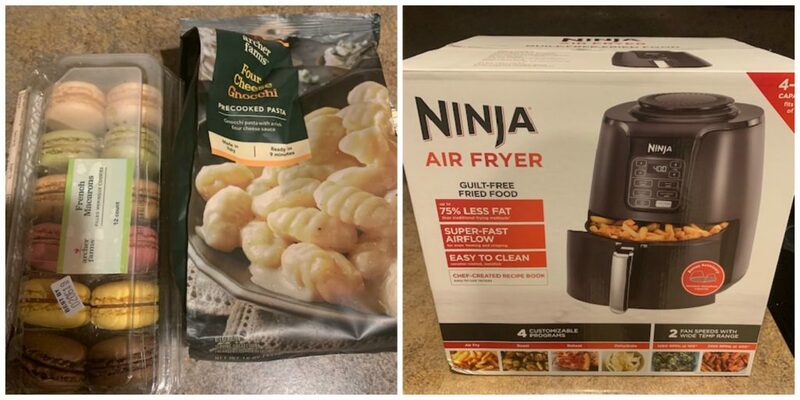 Have you found some good WW recipes for the air fryer? yum to all the food here!! We have an actifry, which is not quite the same thing as an airfryer but pretty much because we have the tray that makes it work 🙂 I need to try out some fun new recipes in it too!! Yay potty training! Go Zoe!! But also wow she is growing up!!! I love skinnytaste. I need to try these healthier snacks. They look really good. Daycare helps so much with potty training. I love it. Yay for Zoe! Those apple snacks look SO good. I need to pack snacks for work, I forget and then am eating a snickers bar at 3 pm UGH. WAY TO GO ZOE- that is so great. It can be hard for us parents to be regimented and training of some sort after working all day and just wanting to relax. I feel ya, but wow- go Zoe, she is determined! I need to check out the food section at Target more. I love TJ’s but it’s a haul to get there! Good luck with the potty training – you’ve got this! Soooo proud of sweet Zoe for potty training! Good luck to you both on the journey. I know its not always easy. First, awesome on the potty training, that’s great especially when they want to do it. Good for your lil lady! Yay for Zoe!! What a clever girl! Taking new steps is sad and tough, but I’m sure Zoe feels SO accomplished and you get to save $$$ on diapers AND you can find some super cute underwear for her! Those apple “donuts” really do love so delicious! And WHY is apple so good on grilled cheese?? I dunno, but it is! Yay for successful potty training! My nephew is right around the same age and it’s so funny watching how excited he gets after he’s had a success lol. It can be hard for the first little bit because you really have to plan out your outings around them, but sounds like she’s on the right track! Aw, that’s so exciting about Zoe! It’s crazy how fast they grow up. I’m going to be shocked when my youngest niece is fully potty trained. LOL Mmm…those apples look amazing. I’ve made something similar before and they are good! I’ve never had a smoothie bowl but I really want to try one sometime! wow, i can’t believe the daycare started potty training her without talking to you lol. but that’s awesome it is going well! i can’t believe she’s already at that stage, she was just born last week 😉 i need to try that gnocchi, yummmm. i really want an air fryer so do share if you find any good recipes! Ooh, that gnocchi looks so good! I need to check my Target for that. I’m going to check the app right now for it.